This was not one of the most photogenic places I visited in Ghent, but it was perhaps the most interesting -- the Small Beguinage of Our Lady of Ter Hoyen. I'd never heard of beguinages before, despite my many years of Catholic education. They were religious orders of women -- beguines -- who lived together, but unlike nuns, took no vows and made no lifelong commitment. They were free to leave at any time, and marry, though part of the reason beguinages were originally created was because so many of the men were off fighting the Crusades and they provided both security and community and an opportunity to live independently outside of a convent or a family home. 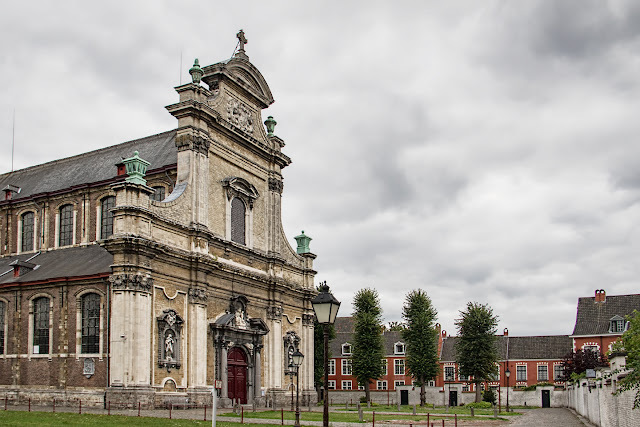 There are still about thirty beguinages in northern Europe, most of them in Belgium, but the beguines are long gone. This beguinage, one of three in Ghent and a UNESCO World Heritage site, was founded in 1235 by the countesses Johanna and Margaretha of Flanders and was rebuilt in the 17th century. Some of the larger buildings here are used as art workshops, but the little houses, each behind a green gate in the white wall and named for a saint, are leased as private residences.